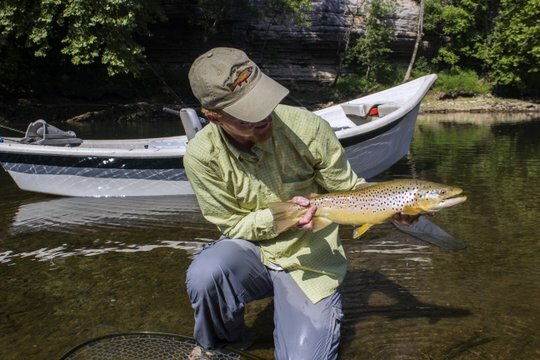 The best day I've ever had on the Caney Fork happened just this week. In fact, as close as possible, I had a repeat again yesterday, but the first was probably the most memorable because it was a trip that almost didn't happen. To put everything in perspective, let me go back a few months to last November. My buddy Jayson gave me the honor of asking me to be a groomsman in his wedding, scheduled for this June. Over the past several months, us groomsmen discussed options for a bachelor party, but for various reasons, none of the plans ever worked out. With so many schedules to try and coordinate, the main problem came down to not having free time together. That and the fact that we wanted to do a trip outdoors. Jayson is another diehard angler as is Pat who is another groomsman. 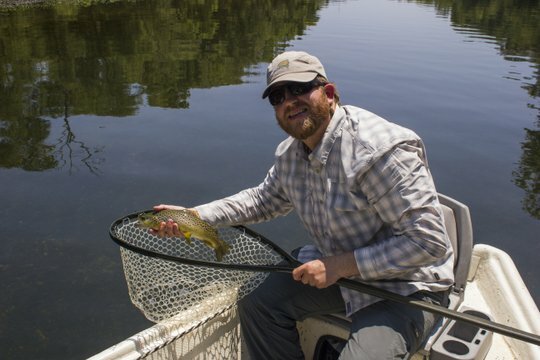 We discussed camping trips, backpacking trips, and of course all revolved around fishing. Eventually, we began to wonder if the bachelor party would even happen. We were all just too busy. Then, the perfect storm of events occurred. What set off the chain of events was a cancelation/postponement that I had. 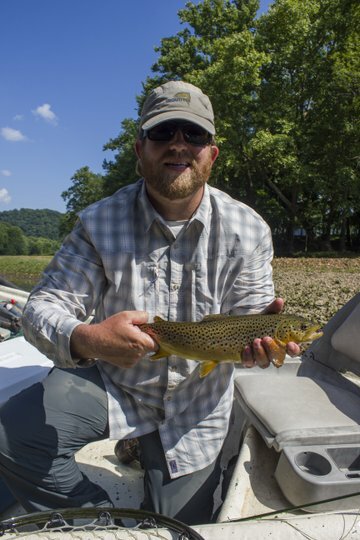 A float trip on the Caney Fork had been on the calendar until about two weeks ago when the clients requested a postponement until the cooler months of fall. They were concerned about the extreme heat we have been experiencing. Naturally, I decided that I should spend the day on the water somewhere fishing for myself. It was then that I remembered the bachelor party. At this point, we were mere days away from the wedding day so time was short to get a trip together. I quickly called Jayson and Pat the other groomsman. Both were able to clear their schedules. Plans were discussed ranging from fishing in the Smokies, the Davidson in N.C., and the Clinch. Eventually we came back to the Caney Fork River and set up a time to meet. Monday June 20 arrived with a couple of x-factors that were going to make the day go from good to epic. Any day on the water with friends is good. It should go without saying, but catching fish is always a bonus in a situation like this. However, we also had perfect flows with the generators pulsing from 8-9 a.m. The summer solstice happened to be on June 20. Oh, and we had a full moon. That last one was a little sketchy. 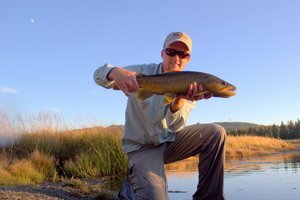 I've had some fantastic fishing during a full moon, and I've also had some really horrible fishing during a full moon. Fantastic and horrible measured purely from a fish catching success perspective I should add. When I saw pictures from my buddy and guide Bryan Allison featuring his success this past weekend, I knew that this might be one of those good full moons. Nevertheless, I warned Jayson and Pat that the fishing could be epic or it could be horrible. Both were in on taking the trip regardless which turned out to be the right decision. Jayson and Pat arrived at my house on Monday morning and we quickly transferred their gear over into my truck and boat and we were off. A short trip to the river had a small detour to get some air in one of my tires. That small detour almost became a long detour when the valve stem jammed, but eventually I got some air in the tire and the valve stem quit leaking. Back on the road, we finally made it to the river and got the boat launched. Rowing out into the river, I dropped the anchor for the usual time spent setting up all the rods. Both of the guys were intrigued by the setup I use to fish the Caney Fork, but after just a few minutes of floating they had caught some trout and were believers in my fishing methods. The fish were keying on midges and that proved to be the situation for most of our trip. The night before I had stayed up late tying lots of extras and it was a good thing as we went through our fair share of flies. A short distance down the river, we finally got a taste of what the day would be like. Appropriately, the groom was the first to strike on a good fish. Jayson set the hook and when the rod nearly doubled over, I quickly instructed Pat to get his line out of the water and clear the area for Jayson to fight the trout. When it rocketed to the surface, we saw that were were dealing with a large rainbow trout. Trying all of its tricks, the trout eventually yielded to Jayson's skill at fighting fish and slid into the net. Pictures were taken, high fives and hand shakes were passed around, and we got back down to the very serious business of catching trout. Not too much further down the river, we pulled over and got out to wet our feet in the cool water. With air temperatures over 90 degrees, the usually frigid water actually felt good. Jayson and Pat were well ahead of me since I still needed to rig a rod for myself. Deciding on a hopper for my strike indicator, I dropped a nymph and midge underneath and started working downstream along a shaded bank. The overhanging branches seemed like a good spot for a terrestrial to fall in. 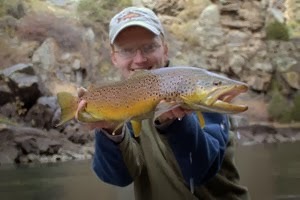 That assumption was rewarded with a solid 16 inch brown trout, my first hopperized brown trout of the year. After releasing the fish, I noticed that Jayson was hooked up and stopped to take a few pictures. Jumping back in the boat, I offered the hopper rod to Pat and pointed out a fish that exhibited a terrestrial rise. He cast once and the fish did everything but eat the fly. Throwing back a second time triggered that reactionary bite we were looking for, and soon he was enjoying his own nice brown trout caught on a hopper. Continuing down the river, we caught fish here and there and broke off some true monsters. Pat seemed to have the corner on the "losing big fish" market unfortunately, but Jayson still had another moment of glory waiting. We had stopped again to wade a second time. This was a stretch of river that I've been watching some large brown trout in and hoped to get the guys on one of those nice fish. Pat found one way up above where we stopped and lost it to a log. I fished slowly and eventually nailed a nice fish on the hopper. Then Jayson struck again. He had been working a nice trout when it finally ate. His yelling got our attention and soon we had the net out and ran down to help. The tippet and knots held, the hook was strong enough, and soon we had more great memories captured with our cameras. 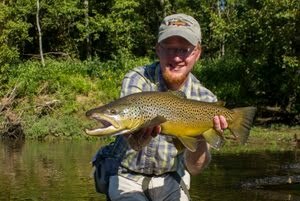 Jayson's second 20"+ trout was a brown trout and featured some amazing colors. Even though he was the groom and thus assumedly being treated extra nice for the day, I informed Jayson that two 20 inchers qualified him for the rowers bench. My moment of glory was literally just around the corner. After rowing around the corner, I turned the oars over to Jayson and jumped into the front of the boat for a few minutes. Almost as soon as Jayson touched the oars, Pat's luck turned and he nailed a great brown trout right off some rocks along the bank. The fish had taken the midge, but the 6x tippet held and the hook was strong. After the obligatory pictures, Jayson slid the boat back out into the middle and we kept drifting. Not too far down the river, I saw a large brown slide out of a deep hole and settle into a narrow slot between two rocks in shallow water. Hey guys, you see that big brown? When they asked where, I pointed and cast. Right under my hopper. My flies drifted through and as I pulled them out for another cast, Pat asked if he could take a shot. My cast was already on the way as I said sure. He started his cast and while his flies were literally hovering over the spot, I saw the fish turn sideways and set the hook. Sure enough, the fish was on my flies. Notice I didn't say that it ate my flies. That is because I initially thought that I had somehow snagged the fish. A lot of side pressure failed to turn the fish at all. In such situations I usually assume that the fish is snagged. I was so convinced of this that I nearly broke the fish off on purpose. I'm not interested in killing a fish for a photo op and a snagged fish is usually going to be too exhausted by the time you land it, if it is big that is. Something in my brain doubted the snagged theory just enough to not break the fish off. 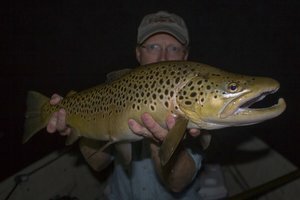 On the next turn, I saw my tippet all the way to the large brown trout's mouth and realized that instead of being snagged, this was just a really heavy and strong fish. I've lost a lot of nice trout through the years. Even a few of them recently. Big fish, not mediocre fish. Things had gotten bad enough that I almost assumed that this fish would eventually come unbuttoned. Somehow everything worked out though, and Pat Tully did a phenomenal job on the net. Thanks should also be mentioned for Jayson's great work on the oars. This fish, as were the other large trout on this day, was truly a team effort. That fish proved to be the final high point of the day. Yes, we still caught more fish, but somewhere shortly after this fish the action slowed considerably. That may just be because we weren't trying very hard. Everyone on the boat was satisfied, but also tired and hungry. We rowed through the last stretch to get done at a reasonable time. A stop in Cookeville for some great Mexican food finished the day in style. Three fish 20 inches or better in one day and at least two others broken off. I would like to think that I'm just getting that much better at this whole "guiding" thing. Maybe I am. 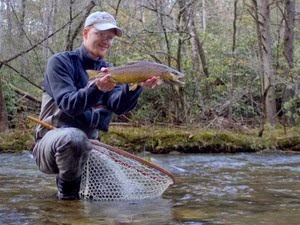 After all, yesterday's guide trip was nearly as epic with several large rainbows and some nice browns caught. Then again, maybe it was just one of those unexplainably awesome days. The full moon, the summer solstice, good weather, a good barometer whatever that means. You know all the excuses we fly anglers give when the fishing is bad. For one day, at least, we didn't need any of them. 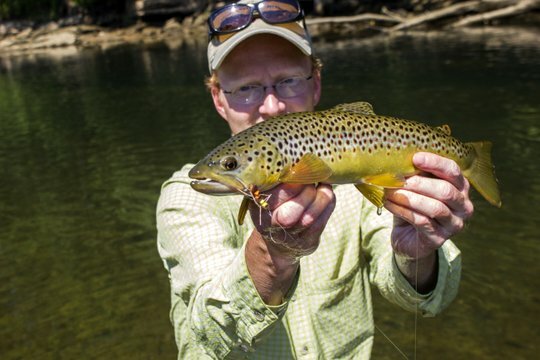 I anticipate the fishing on our tailwaters to continue to be fantastic through the summer. I'm getting some great reports from the Watauga and South Holston as well as the Hiwassee. 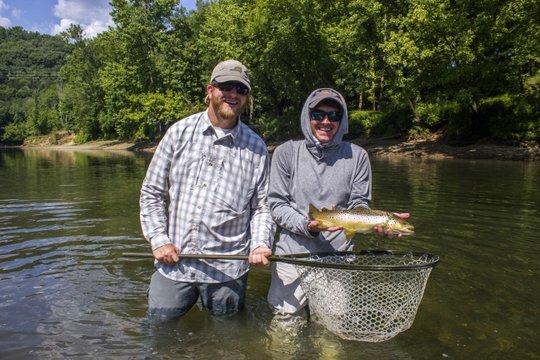 The Clinch and Holston Rivers continue to fish well. 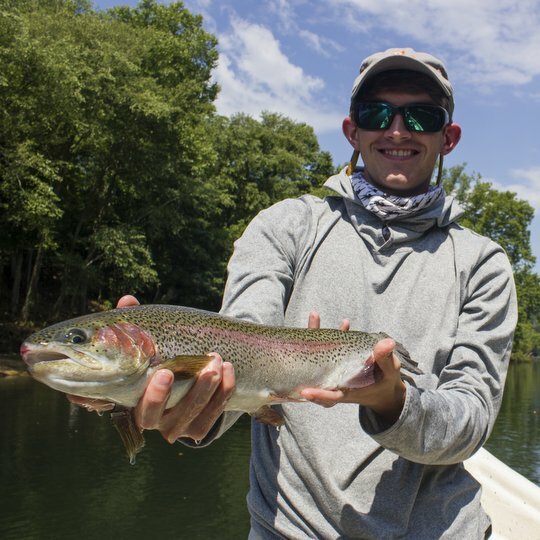 Today I netted a 21.5 inch rainbow on the Holston and later caught some nice trout for myself. 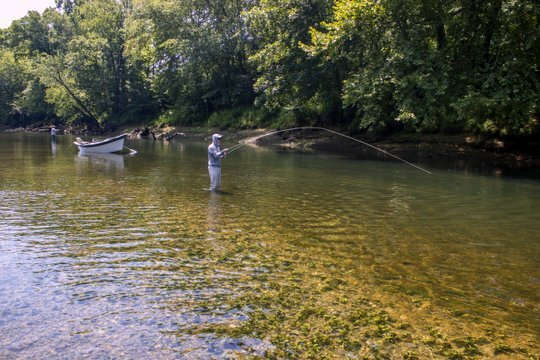 The Caney Fork will fish well on less crowded days. The right patterns and techniques are essential now with the water cleared up from the murky days of spring. If you want to get in on this great fishing, contact me about a guided wade or float trip on the Caney Fork River. You can reach me via email at TroutZoneAnglers@gmail.com or call/text (931) 261-1884. I'm booking trips well into July now with no availability until the second week of July. The fishing should stay good on this river through the summer and fall if we continue to experience low water. Bill, I'll look forward to running into you on the river on a regular basis! Great way to be sent off to wedded bliss.